besides being over come by stress, I am staying intact. enjoyably intact, even. just because I don't have the best, highest GPA, doesn't mean I'm a failure. just because I don't get an A+ on everything, doesn't mean I have to be down on myself. just because it's junior year, doesn't mean I have to sacrifice my life. Do you remind yourself of your reality often? In what cases do you do this? Does it help? I have to also thank you all for your wonderful comments on last post! I think I got a little too snap happy and took way too many pictures. Gah! 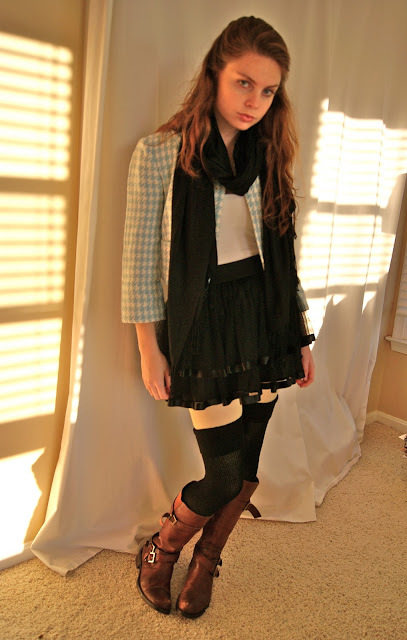 Look 2 is my favorite - that free People Sweater is perfection, Emily! Wow you have beautiful hair! and i loove the outfits...adorable!! great post!! Loooove the boots in the first couple pictures!! I especially love the second outfit! I love the last outfit! And I'm so glad I found your blog. I'm recovering from an ED too and it's nice to know that there's someone out there like me, going through the same sorta stuff I am.